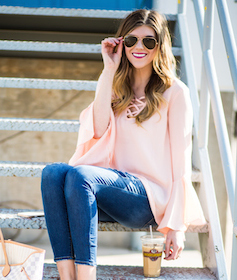 How adorable is this flowy tunic? The choker neckline is just to die for and the color is stunning! SheInside is a clothing company that provides adorable clothing at affordable prices! If you are like me I’m sure you have seen their ads on Facebook, Google, and other places around the internet! I immediately was drawn to their prices because lets be real, this mama doesn’t have $100 to drop on a top! #notevenclose I was so excited when I received these two tops in the mail and was blown away by their quality for the price that I couldn’t wait to place a full order! I’m linking everything that came home with me + a few favorites that I haven’t purchased just yet! Hope you enjoy & let me know whatcha buy! Thank you to SheInside for sending over these items! All thoughts, opinions, & images are that of my own! Please refer to size guide on their website as their sizing is different! That jacket looks so comfortable!! Love the shoes too! I love that tunic! It is so pretty and I love that it came in one of my favorite colors – red! I love how you paired it with those leggings and boots. I will have to check SheInside and probably purchase from them too. My husband is underappreciated, too. I am loving the second outfit big time! I have yet to experience being a single mother, but never know if that’s going to change or not. I’m so sorry that you are having such bad days. You look really good though, that tunic is to die for. I love everything about your first outfit from head to toe! I just adore the floral dress! Pairing it with the black bottoms is a great choice for the colder weather. I love the red blouse since that is my favorite color. The entire outfit is really great and I like that you can wear it during the day and in the evening. Awww is not that something! I can only imagine this feeling and just reading it I can feel the overwhelm! Yes find some time to relax and rejuvenate! 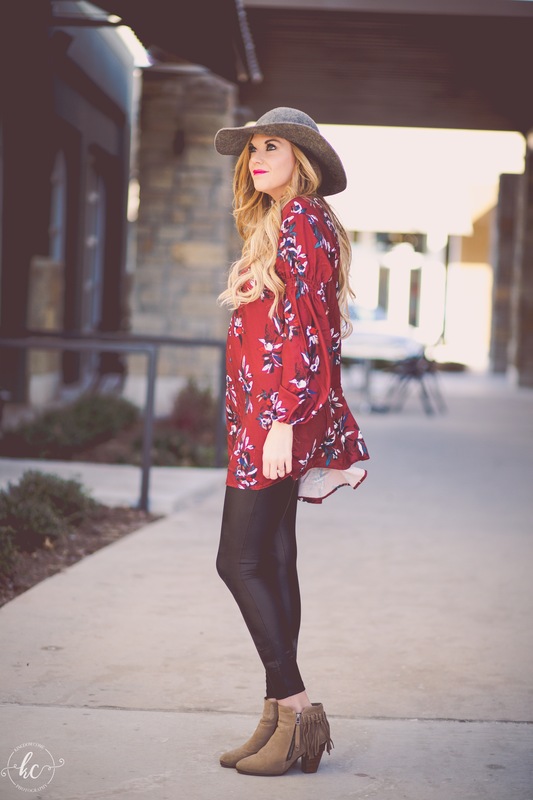 Love the gorgeous tunic and booties!!! Such a great fall color combo!! Love the looks! I really wish I could pull off a hat like that! It would be so helpful when I don’t need have time to wash my hair ???? I have this same floral top! I love how you styled it! I plan on wearing mine with white jeans, a little springish look 🙂 Thanks for sharing! That flowy top is amazing! I love the color and how you styled it! I needed to see this today , I love seeing raw and real life . My little one is 20 months and I feel like I’ve failed at what kind of mom I said I would be. “My kid will not be the whiny kid” ,”my kid will not be picky and I will get them to eat everything “ , etc. well she’s been whiny , she hardly listens , she tells me no, doesn’t want me to love on her sometimes, it’s a battle to get her to eat anything but “junk” …. bottom line, I feel like a huge failure. I need reassurance that it’s a phase and all kids go through this lol. Is this where terrible twos came from? ?